Today while walking by the river again, I saw such a beautiful house in the middle of nowhere. In one of the trees of this house I saw an ara macaw. I didn’t know whether the macaw was there because it got there flying or it belonged to the people of this house, so we approached to one of the persons who was in the house and asked if they owned this bird. When she told us that they owned the bird we asked if we could go in and take some photos. We were absolutely amazed in the garden because we saw more than one macaw, there were 4 and they were absolutely free, but in the last 10 years they haven’t left the area because they get food there every single day. 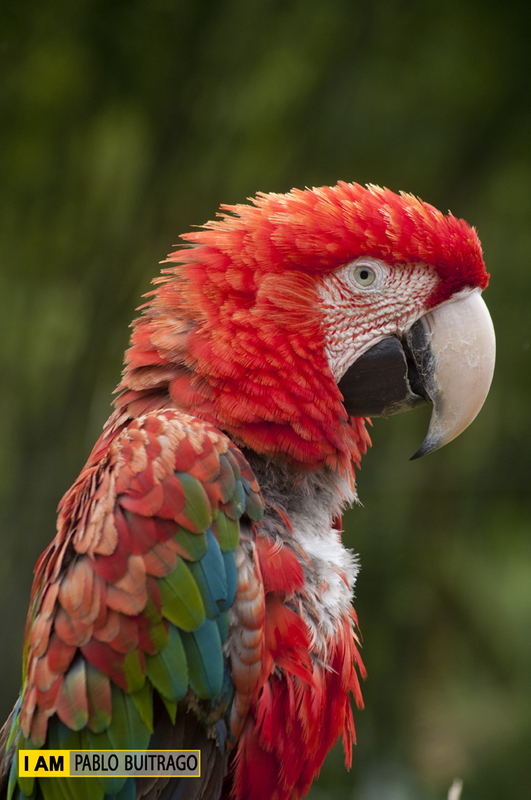 There are more than 17 species of macaw, this one is called Ara. They are mostly red, with blue and green wings. The bare white skin around each eye extended to the beak is patterned by lines of small red feathers. That can be seen if you see the picture bigger by clicking on it. 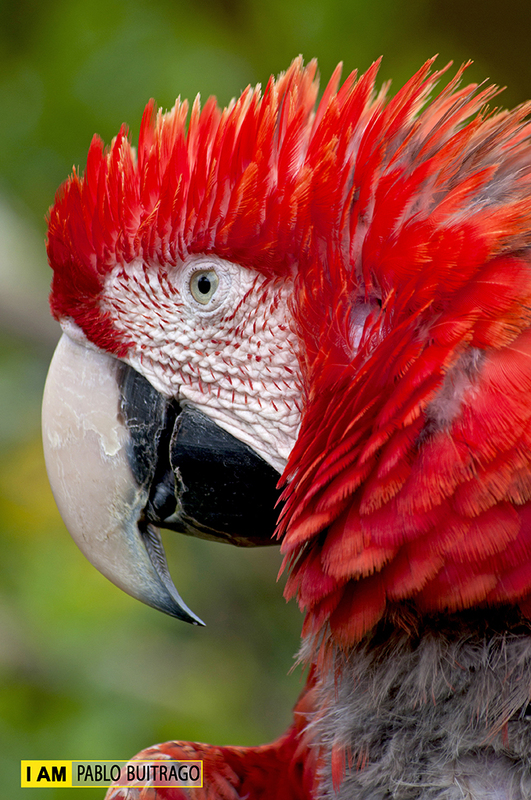 In order to eat, ara macaws break their food using their strong beak. They normally eat fruits, nuts, seeds and even snails. Exif Data: Nikon D5000 ; lens: Tamron AF 55-200 ; 100 mm, ISO 250; f/5,6 ; 1/500 s.
Hoy mientras caminaba por la orilla del rio, v una casa muy bonita en el medio de la nada. En uno de los árboles de la casa vi una guacamaya; no sabía si estaba ahi porque pertenecía a los dueños de la casa o sí simplemente había llegado allí por sus propios medios, así que entramos y hablamos con una de las personas de la casa, y le preguntamos si podiamos tomar algunas fotos. Tienen 4 guacamayas, que legaron ahí hace 10 años, están completamente libres pero no se van porque allí son alimentadas cada día. Hay más de 17 especies de guacamayas, éstas se llaman Ara. Las Ara son en su mayoría rojas, con plumas azules y verdes en sus alas. La parte blanca alrededor de cada ojo que se extiende hasta el pico, tiene unas lineas con pequeñas plumas rojas que se pueden ver si aumentan el tamaño de la foto. Para comer, las guacamayas quiebran los alimentos utilizando su pico que es muy fuerte. Normalmente comen frutas, nueces, semillas y hasta caracoles. Datos de la foto: Nikon D5000 ; lente: Tamron AF 55-200; 100 mm, ISO 250; f/5,6 ; 1/500 s.